This research paper monitored Romanian mainstream media and social media for a month after a tragedy occurred. The fire occurred during a rock concert with 400 people in the club at the time, killing 64 and injured over 100. Minodora Salcudean and Raluca Muresan use “#Colectiv” to collect the data from the online press and from social media (mainly facebook, Instagram and twitter). The authors’ research suggests professional journalists still act as “responsible filters” when reporting the emotional tragedy. The authors believe the journalists make use of the authentic information and opinions from social media thus produce quality news report when covering a fire tragedy. This research could be more comprehensive if the authors could take the impact of the picture into account when investigating how journalists use social media as a source and how emotional items are being quoted. As mentioned by the authors, social media is a cheap and convenient source of information, particularly in terms of citizen’s opinion and image-on-site. The latter is essential to the news report of tragedy, as 1) media might not have the resources or time to report onsite during the occurrence of tragedy; 2) news report with pictures, especially when related to victimization and emotions, are often found to have a greater popularity when compared to reports without images. Journalists could, therefore, be more likely to include images than text in their reports of tragedy. Information from social media is a double-edged sword. Acquiring information is one thing, verifying is another. In the social media (and citizen journalism) era, fact-checking has never been so important for journalists. Journalism is valued due to credibility. Speed should not be a substitute for accuracy. The result suggested by this research is optimistic; whether it is the overall trends of journalism practices need to be examined in other countries, as well as in non-tragic daily life period. Minodora Salcudean and Raluca Muresan. 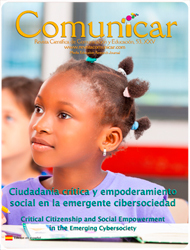 “The Emotional Impact of Traditional and New Media in Social Events.” Comunicar, 50 (2017). We are very pleased that the preprints of our thematic proposal “Technologies and Second Languages” have now been published. It has been a very hard selection and edition as manuscripts arrived from all over the world. The final print and online version won’t be till the 1st. January 2017. Addressed to the worldwide research community, the article Internet and Emotions: New Trends in an Emerging Field of Research (Serrano Puche, 2016) is a useful guide both for researchers and practitioners. It overcomes the typical dissociation between different research fields and explains the importance of affect, the mediation effect of emotions in any human activity, also while surfing the net or in relation to the use of digital technology. This article reviews studies that have analized emotions such as empathy, annoyance, envy or jealousy, resentment, hope, hatred or grief expressed in the different social media. Not less relevant is the analysis of emotional contagion through social networks and the viral spread phenomenon. Without any doubt, the study of emotions in any research field, as in this case in Media and Communications studies, helps us to better understand the way in which this affection has an influence on the personal identity of humans. From the two articles published recently on Comunicar, I spot that there has been an increasing interest on elderly’s ICT utility in the academia from different regions. Authors of the articles published in this issue all pointed out that, previous studies used to focus on ICT use among the young population, who are always the pioneers in waves of social change. But with the prevalence of ICTs, elderlies also join the force, and make a special area for exploration due to some special characteristics carried by this group of population. Bosch & Currin, focusing on the active role of the old people, found out “how” and “why” some South African elderlies use computer in their everyday life. The need to communicate and the aspiration of new information have made important reasons for them to use new technologies, especially when they encounter some unavoidable inconvenience when getting older and older. Llorente, Viñarás & Sánchez stressed on what have been brought to the old generation when ICTs become part of their life. Information, Communication, administrative purpose and leisure are the main advantages brought by ICTs. These are also correspondent to Bosch & Currin’s study on old people’s computer use. Admittedly, I mostly agree with the above authors and I have to say that personal computers and ICTs (internet-based mobile devices) have had big influence on the elderlies in my own family – active ageing. For example, among my family members over 80-year-old, there is a 100% penetration of mobile devices and 80% penetration of internet devices. My grandfather is 86-year-old now and he uses iPad over 5 hours each day for family communication, news reading and entertainment, which are exactly the features pointed out by Llorente, Viñarás & Sánchez. However, he always has hesitation in terms of online transaction. He still remains a traditional way of financial management by keeping money in the own pocket. While e-commerce has become popular among the young population, is it also applicable to the old generation who is also ICT users? How to further explore the nuanced generation difference in different aspects of ICT use? Is there any cultural difference on the issue of ICT-elderly relationship? As I have observed that the online contents attract old people’s attention have very large difference with those draw young people’s attention. In Chinese society, we have something called “graphs of the elderly” (conservative messages or benediction words in very coarse graph design). Is it a noteworthy aspect for further study from a qualitative approach regarding generational differences of online contents? The traditional tertiary services approach is now questioned by the new technologies revolution, opening discussion regarding the existence of a quaternary sector. There is no doubt that the internet has changed people’s lives, especially since the beginning of the 21st Century. However, limited research exists about its impact on our ageing process. Dr. Llorente-Barroso, Dr. Viñarás-Abad and Dr. Sánchez-Valle have carried out a study that aimed to find out the usefulness of the internet for the eldest in society, as well as explain the potential of the intranet to encourage an active ageing. The study included participants with an age range of 56 to 81, where answers and reactions provided valuable results. Focusing on the possibilities for those ageing in the internet era, results show that there are four areas of interest: information, communication, transactions and administration, leisure and entertainment. The internet can be used to optimise their quality of life in relation to these categories. Bearing in mind that according to the UN, Spain will have the third eldest population in the world by 2050, research that promotes ways of inclusion and progress between the old population and the digitalised world are more than interesting and worth reading. Do not miss your chance to find out details about the above-mentioned article in the following link. Llorente-Barroso, C., Viñarás-Abad, M. & Sánchez-Valle, M. (2015). Internet and the Elderly: Enhancing Active Ageing [Mayores e Internet: La Red como fuente de oportunidades para un envejecimiento activo]. Comunicar, 45, 29-36. (DOI http://dx.doi.org/10.3916/C45-2015-03).